After years of being on a never ending tour, I finally found a place to take a rest and come home to. Now I am finding the time to pull all my work and research of the last years together and develop it in the way I intended. Unfortunately, the format of a blog feels not right for this. This is why I am leaving Sunshine in My Throat for now and moving on to Beyond Resolution. »ЯOSΛ MEИKMΛN (portfolio || Resume ) Every technology possesses its own inherent accidents. ▉ My work focuses on noise artifacts that result from accidents in both analogue and digital media (such as glitch, encoding and feedback artifacts). These artifacts can facilitate an important insight into the otherwise obscure alchemy of standardization via resolutions. This process of imposing efficiency, order and functionality does not just involve the creation of protocols and solutions, but also entails black-boxed, obfuscated compromises and alternative possibilities that are in danger of staying forever unseen or even forgotten. ▉ Key to the study of resolutions is the understanding that a resolution is not just an agreed upon setting or solution, that is set by the actors that have for instance economical or political motivations. Resolutions also inhabit a space of compromise. Within the realm of video for instance, this compromise is illustrated by the quadrilateral interface. Because of video standards, set through resolutions, the history and material of video forecloses anything beyond these four corners. While resolution studies is closely connected to the discourses of for instance protocological, habitual and material research, resolution studies creates an important and otherwise missing space for other, new, speculative implementations. ▉ In 2015 I started the iRD, the institutions for Resolution Disputes. 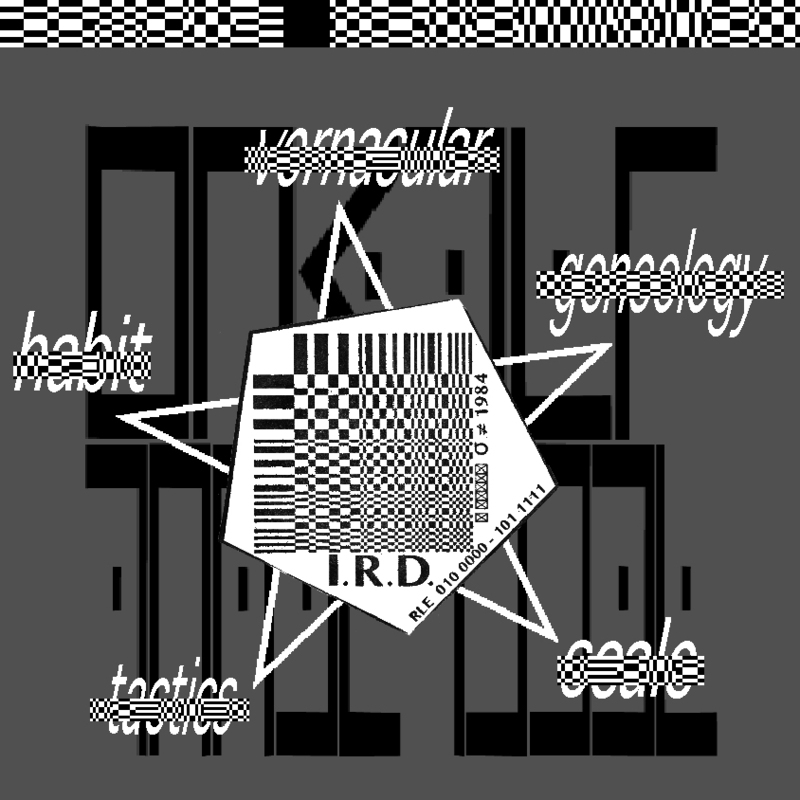 Via the iRD, I aim share my knowledge and build more awareness about the compromises set by the resolutions inherent to our media and in doing so, I intend to bring back some form of authorship to the mostly obfuscated layers of resolution setting. ▉ Works that are most illustrative of my practice are “Vernacular of File Formats" (2010), “Acousmatic Videoscapes” (2007), the “Collapse of PAL” (2010), “Xilitla” (2012-2013), the iRD (2015—) and DCT:SYPHONING. The 64th interval (2016). In 2015 and 2016 I was part of the curatorial team of Sonic Acts. I have also been a co-facilitator of 5 GLI.TC/H festivals (2111-2112). I am a certified captain at the institutions for Resolution Disputes. |||I|I|I|II|I||| Our best machines are made of sunshine; they are all light and clean because they are nothing but signals, electromagnetic waves, a section of a spectrum.— Haraway, Donna. “A Manifesto for Cyborgs” 1985.